Vegan milk alternatives are a wildly various bunch. 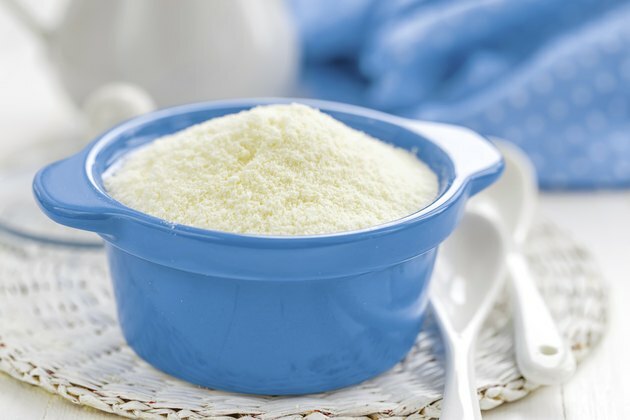 If it's powdered milk you're after -- whether to keep on-hand for emergency shortfalls, beef up a bread recipe or add body to smoothies -- you'll have several options to choose from. When you do, you'll be evaluating a number of factors: nutritional content, heat characteristics, consistency and taste. Each has distinct benefits and strengths, so you may decide to clear out a pantry shelf and stock them all. Reconstituted soymilk powder tends to curdle at high heat and with the addition of acids. This is due to soy's natural proteins -- the same proteins that give soy a hearty texture and a rich consistency, which lends a creamier mouthfeel to baked goods, sauces, gravies and soups. Though it doesn't thicken to the richness of soy, protein-poor unflavored powdered rice milk has a more "dairy" flavor than soy. It lacks soy's accompanying sweetness, as well as soy's tendency to curdle; however, it's much more neutral and, therefore, flexible in different types of recipes. Almond milk powder -- essentially, a superfine grind of almond flour -- is very similar to rice milk powder in consistency and behavior. However, almond has a more mineral-rich nutritional profile than rice. Almonds' natural slight sweetness is a better match to curries or desserts than it is to savory dishes. Coconut milk powder contains casein, a milk derivative, and is thus unsuitable for practitioners of a vegan lifestyle. Dairy milk powder started its "life" as liquid milk, heated to evaporate about half of the component milk solids. Adding water back into powdered dairy milk is easier than adding water to vegan milk substitutes, which are generally derived from superfine grinds of solid vegetable matter. Therefore, where powdered dairy milk can generally be stirred into water by hand, powdered vegan milk substitutes are best reconstituted in a blender to avoid clumsiness. To reconstitute into a thick, creamy vegan "creme," add about a tablespoon of emulsifying lecithin granules. While powdered dairy milk lasts between two and 10 years, vegan versions are far less long-lived. Though it's an excellent idea to check the packaging of the brand and type purchase, most vegan milk powders are only shelf-stable for at least six months; in some cases, a little more than a year. To get the most mileage out of them, store vegan milk powders in a cool, dry cupboard, carefully protected from moisture. The "on-label" use for vegan powdered milk is clear: reconstitute using ice cold water, using the proportions given on the package, and serve in a glass. "Off-label" uses for the powders abound, however. Blend the powder into creamy smoothies, spoon into individual-serving containers with dry cereal for a just-add-water breakfast, substitute for dairy milk and cream in baked goods, whip up homemade vegan hot cocoa mix and add a velvety texture to animal-free soups. Are There Nutritional Differences Between Fresh Milk and Powdered?